This probably sounds like an odd way to start an essay on an album, but growing up, I wasn’t really much of a “music guy.” I appreciated what I heard on the radio, but most of my musical tastes were informed by the people I hung out with in high school (alt-metal punks and girls who liked techno). I had fumbled my way through playing the trumpet for a couple of years in middle school, but to this day, I still can’t read sheet music very accurately. I sort of laugh when I see my friends post things like “I could never trust anyone who doesn’t love music more than anything” because, heh, that’s me. What I did get were cartoons. I’d faithfully wake up around 7:00 every Saturday morning to watch them, without fail. The advent of Cartoon Network meant that I had increased exposure and opportunity to watch them as I grew older. I got into anime, old Hanna-Barbera stuff, the whole nine yards. As I realized my peers had mostly moved on to primetime dramas and the like, I kept it to myself, but animation remained my first love. That’s why I’m so grateful to The Gorillaz, who provided a pathway for me into critical thought about music. I first heard Demon Days probably in the fall of 2005, at a kiosk with headphones at the Barnes & Noble where my mom worked. I’ll freely admit that the main thing that drew me to it was Jamie Hewlett’s artwork on the cover. “This is that cartoon band!” young Joe thought to himself. That was honestly all it took for me, in those days. Something a little less intimidating than pop stars or rock bands. Demon Days opened my mind. Prior to this album, I had all the familiarity with rap of a white kid in Catholic school, so… just Eminem, for the most part. 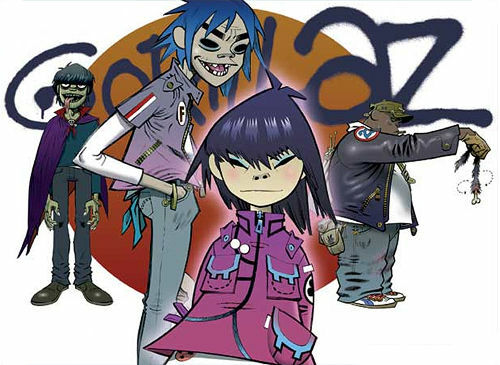 The Gorillaz introduced me not only to Damon Albarn, but to De La Soul, MF DOOM, Bootie Brown, and more. I can trace a ton of my all-time favorite albums and musicians through a web that goes back to Demon Days. It also held onto the zeitgeist long enough that my fascination with it became a bond with others. I started college in 2007, going to a large university two hours away from home on the other side of the state, with very few friends coming with me. I hadn’t quite yet grown into the social butterfly I am today, so I spent a lot of the first few weeks in my room, while my roommate got to know everyone in our dorm. Eventually I happened to mention being a big fan of The Gorillaz, and the effect was electric. Within two weeks Demon Days was blasting through his speakers at all hours, our room was decorated with Gorillaz posters and figurines, and we were best friends. The album itself is a bit of a departure from their debut. 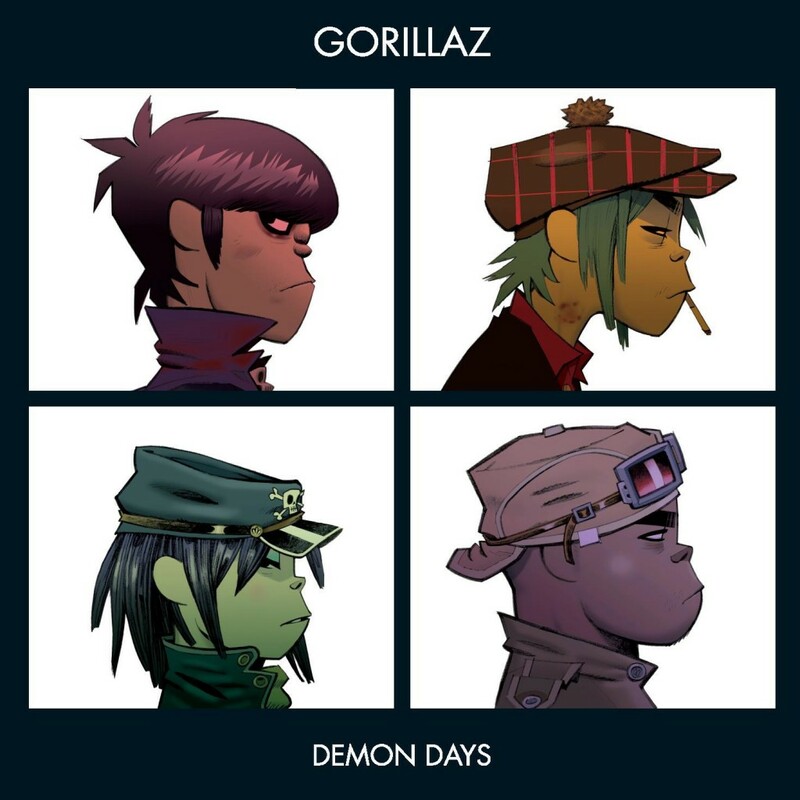 Rather than the various disjointed tracks of electronic or hip-hop flavors, Demon Days provides a cohesive, full experience, moving deftly from radio-friendly tracks in the first half of the album into spoken word and other experimental forms. There’s a sense of melancholy that pervades that album from the beginning, but it becomes more pronounced musically as it progresses. Even early, more radio-friendly tracks like “Dirty Harry” and “Feel Good Inc.” use their upbeat melodies to disguise political messages and bleak existentialism. Demon Days is a cautionary tale, a trip through the end of the world from war, violence and environmental crises that never becomes too moralistic but still takes a clear stance. I’ve focused a good deal on Demon Days as a hip-hop album, which is mainly how I experienced it the first time around. 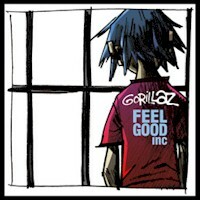 At the same time, it’s still an effective rock album, expanding and refining The Gorillaz’ “trip hop” sound. “El Mañana” is a sad, chord-driven reflection, contrasted with police sirens. I tend to like songs that encapsulate atmospheres, and “El Mañana” specifically has the perfect “walking/driving in a city after dark” feel I like. “Every Planet We Reach Is Dead” breaks down into more freeform riffing and synth from what is initially another introspective piece. Albarn expands electronic elements he explored in Blur, but synthesized sections feel just as at home as plaintive vocals or rapped bars. A lot of this, I think, is due to the band’s nature as an explicitly fictional creation. Since we know that the members of the band exist as trippy, caricatured cartoons, it’s easy to imagine them producing this sound. The band is designed around the music, so they’re necessarily malleable. This is a band you can literally reinvent whenever you need to, so while they’re given characterization, the drummer also has various ghosts in his head who are voiced by guest rappers. It’s important not to understate Jamie Hewlett’s contributions to the band and the aesthetic. Rather than lyrics or acknowledgements, the CD came with a miniature art book, with pages serving as “cover art” for each song. This was extremely important to me. As someone who was still so focused on visual media at the time, it gave me something to focus on, and each of them nail the aesthetic of the respective song really well. Gorillaz have always been good at multi-media engagement, through art, music videos, and more esoteric things like a website that worked like a Flash game, and these things all really spoke to me as a young nerd. Demon Days is still my answer for the “favorite records” question. It had a profound effect on me as a teenager, and I honestly owe a lot of my initial coming out of my shell in college to it. Aside from all of that, it’s also a varied, impressive album, like a sampler of the best that five or so different genres have to offer.